Construction completed in March 2013. 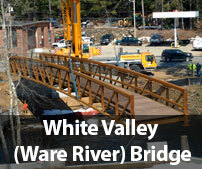 This heavy-duty, 98-feet long bridge spans the Ware River in Barre, adjacent Rt. 122, directly across from the Mass DOT maintenance garage, 1 mile west of the Barre-Oakdale border. See a video of the bridge installation at https://www.youtube.com/watch?feature=player_embedded&v=feXdxToELUI. Click on the icon to see photos of the project.